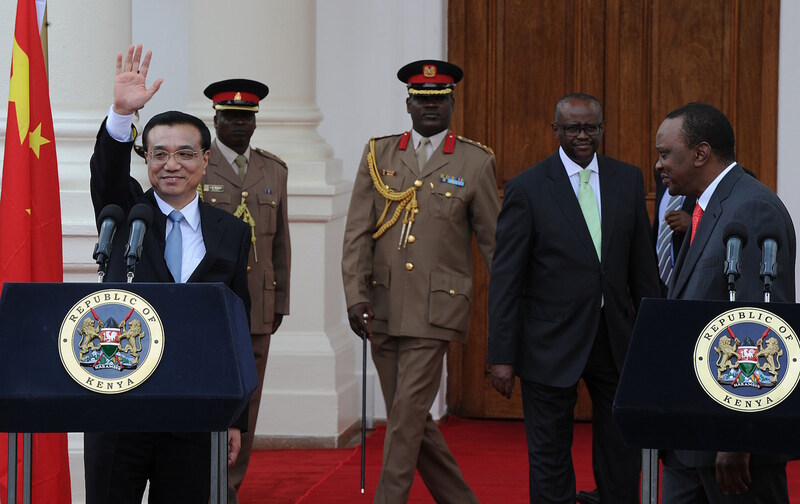 China's Premier, Li Keqiang (L) at a press conference with Kenyan President Uhuru Kenyatta on May 10, 2014 at State House in the capital, Nairobi. Premier Li's Nairobi visit was the final leg of a four-nation Africa tour expected to boost trade, transport links, and conservation. Four years and hundreds of billions of dollars later, China’s ambitious global trading strategy known as the “New Maritime Silk Road,” or “One Belt, One Road” (OBOR), is now coming to life, particularly in parts of East Africa where major infrastructure and defense projects are being built. New ports in Tanzania, rail lines in Kenya, naval facilities in Djibouti, and industrial zones along the Suez canal in Egypt are all intended to support this massive new trade network that President Xi Jinping hopes will become a key pillar of his foreign policy agenda. With the first phase of construction nearing completion in East Africa, focus is now shifting to the next stage, where Chinese planners are reportedly considering expanding the trading route inland into Central Africa. This is prompting intense new lobbying battles among African countries to win Beijing’s favor and the billions of dollars of badly-needed infrastructure investment that come with being a node on the “One Belt, One Road” network. Many outsiders know very little about “One Belt, One Road” and its history. The incorrect assumption is that this is a new phase of Xi’s more assertive global foreign policy designed to challenge the U.S.-led international economic order. Actually, OBOR is rooted in a decade-old policy that was designed to counter fears of a hegemonic China. The so-called “Peaceful Rise” or “Peaceful Development” was first introduced by former Chinese president Hu Jintao when he promoted the concept of fusing China’s expanding foreign policy objectives with a development agenda and a global trading strategy. Matt Ferchen is an Associate Professor of International Relations at Tsinghua University and a Resident Scholar at the Carnegie-Tsinghua Center for Global Policy where he is a leading OBOR expert with a particular focus on how it will impact the global south. Matt joins Eric and Cobus to discuss the new politics of Chinese trade.